Marvel Entertainment's superhero bonanza is closing in on "Titanic" and "Avatar." 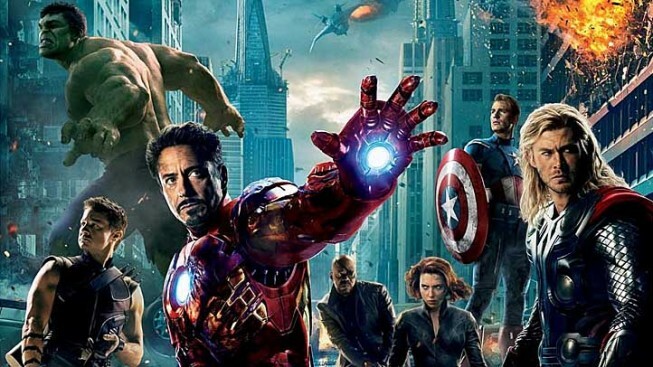 "The Avengers" is one of the highest-grossing movies of all-time. "The Avengers," Joss Whedon's crowd-pleasing superhero epic, offically reached the $600 million mark at the domestic box-office on Tuesday—yet another significant milestone for what's already the highest-grossing film of 2012 and the third highest-grossing domestic release of all-time, Walt Disney Pictures announced Tuesday. However, the Disney/Marvel box-office behemoth—starring, among others, Robert Downey Jr., Samuel L. Jackson, and Scarlett Johansson—didn't cross the $600 million mark as fast as James Cameron's "Avatar" did. Furthermore, "The Avengers" isn't expected to top "Avatar" or Cameron's "Titanic" on the all-time grossers list. ("Avatar," which was released in 2009, reigns supreme at $760 million domestically). Nevertheless, "The Avengers" is a certifiable mega-success, with a whopping global gross of $1.438 billion. The action-adventure flick also holds the records for the biggest domestic opening and second-weekend grosses, according to Variety. Moreover, according to Entertainment Weekly, "Avengers" was also the fastest film to cross the $200 million, $300 million, $400 million, and $500 million benchmarks. Of course, "Avengers" has also outgrossed every Marvel superhero movie by a longshot, outperforming the combined domestic hauls of "The Incredible Hulk," "Captain America: The First Avenger," and "Thor"—the three flicks that made waves in the lead-up to Whedon's ensemble smash.